Become a city builder and watch your civilization come to life and evolve through the ages from Stone Age all the way to the Space Age. Age of 2048 is a city building puzzle game like no other. The object of the game is to combine matching tiles in order to c reach the magic number of 2048. The game is over when there are no more moves on the board, i.e the board is full. So players have to plan their moves and think strategically if they are to succeed and get the mythical 2048 tile. Players can continue playing after they have received the number 2048 score. It pretty easy to move around the game itself. Players are able to move the different tiles within the game by using the up, down, left or right arrow. Every time a player moves the arrow a new tile will appear. When moving the tiles, the whole board moves and not just the one tile and this is what makes the game very challenging. The tiles tend to move as far as possible in the chosen direction until they are stopped by the edge of the grid or other tiles. If two tiles of the same picture or building happen to merge together when moved they will then combine and change to become one whole upgraded building. There is a scoreboard on the upper left corner of the game and a player’s highest score is also shown here. 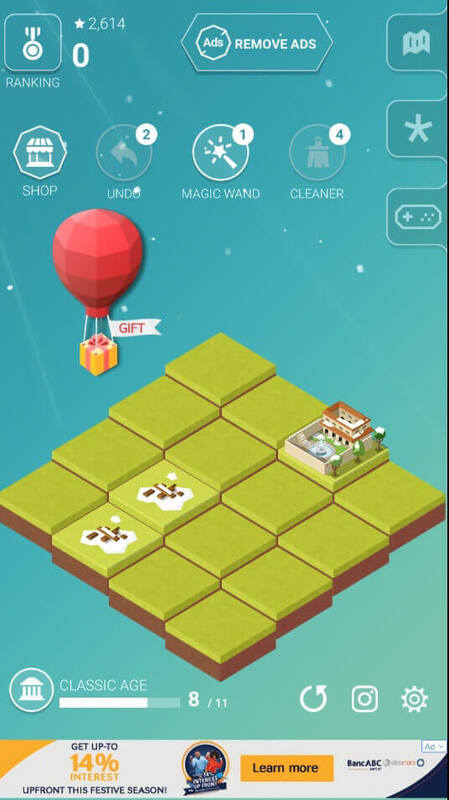 Here players also get a choice of the undo button, a magic wand button and a cleaner. The undo button does exactly that; it undoes the moves that a player makes. 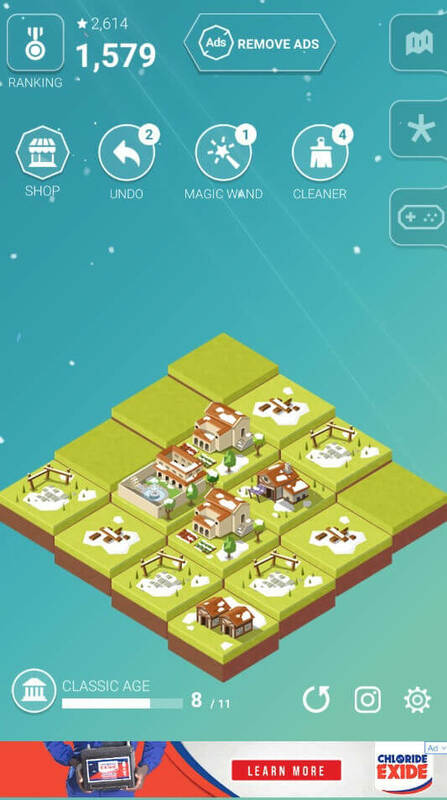 The magic wand button upgrades selected buildings while the cleaner button removes several buildings from the board games. All these options/buttons have a limited amount of time that they can be used within a certain round but players are given the chance to shop for these buttons. On the other hand, players are given gifts within each round but only after watching an advert. The game looks and feels fantastic, with its remarkable cool winter background, players will sure to find themselves mesmerized by the experience. Plus the smooth cool ambient music from the background will entice even the dullest mind. Plus, the game offers different buildings and structures for each age. 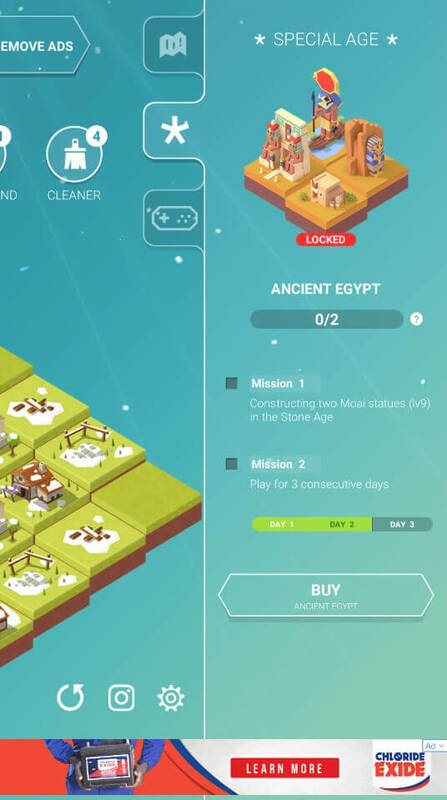 Players can find different structures in the classic age, medieval age, industrial age, global age, and the space age. There is also amazing buildings you can construct in a special age. Remember when playing the game players need to slow down and think. The game is not as easy as it may look. Players also need to remember to plan ahead, understand how the board moves and always make moves where multiple tiles are able to merge together with only a single move. This is definitely a great game, especially for those who enjoy puzzles. But even if players do not enjoy puzzles, they will still find this game incredibly addictive.